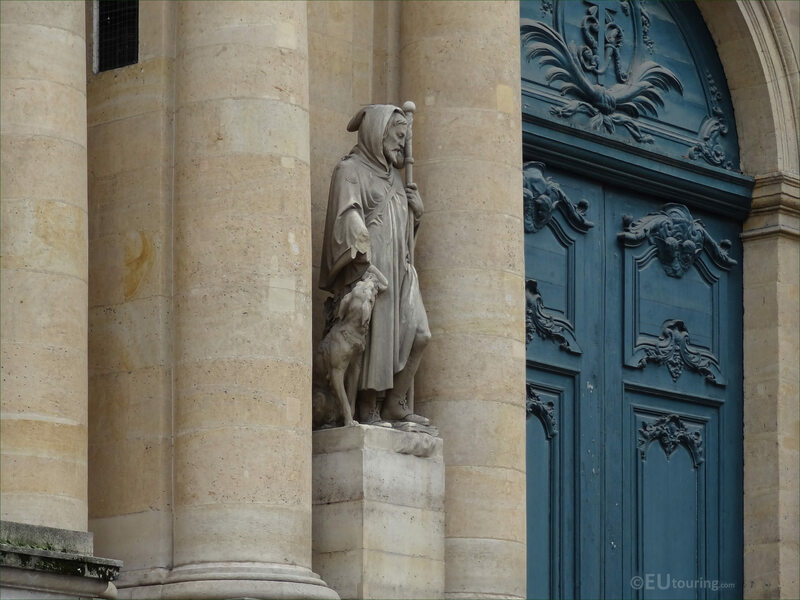 While we were at the Eglise Saint-Roch in the 1st Arrondissement of Paris, we took these high definition photos showing a statue of Saint Roch, which was sculpted by Pierre Loison. Saint Roch was apparently the son of a Governor who went on a pilgrimage to Rome where he devoted himself to caring for the sick and victims of the plague, although he contracted the plague himself, yet managed to recover, so this is why in art, like you can see in this first HD photo, he is shown holding up his robes so that people can see the scarring on his thigh from this disease. Yet another attribute of Saint Roch is the fact that he was always accompanied by a dog, usually holding a loaf of bread in its mouth, and this is how this statue on the Eglise Saint-roch dedicated to this saint was portrayed, although, as you can see, over time this has been damaged and part of the dog plus his hand and part of his right arm are missing. 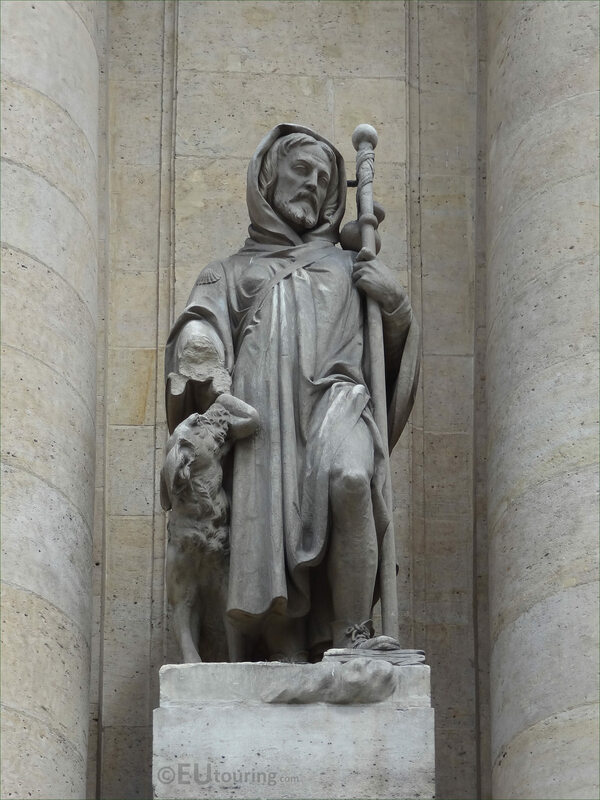 According to ancient accounts and writings, when Saint Roch, also known as Saint Rocco in Italy, San Rocque in Spain, sometimes Saint Rock in Britain, with many other variants, returned to France, he was imprisoned and died after approximately five years, yet it was only after his death that the person who ordered his imprisonment, his uncle, realised who he was due to a birthmark in the form of a cross. Apparently he died on 16th August 1327, although this has been disputed, but with his popularity and the miracles people heard about that spread, even Pope Alexander VI constructed a church and a hospital in his honour, yet it was not until Pope Gregory XIV that he was officially recognised within the Roman Catholic Church Martyrology with a feast day of 16th August. 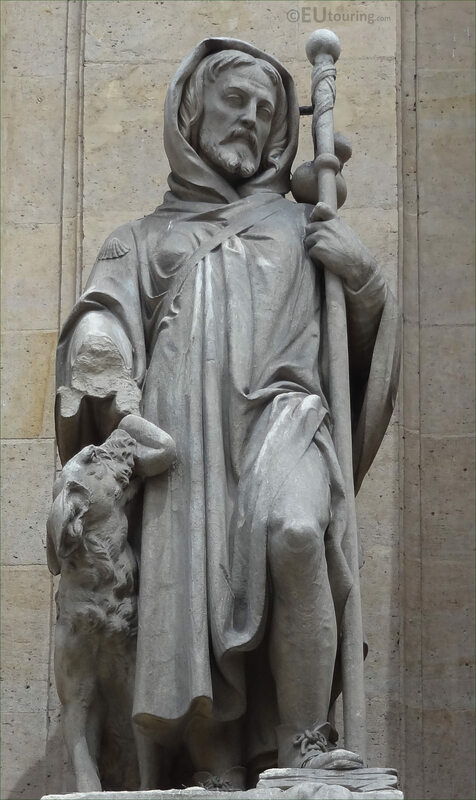 Now we do not know exactly when this particular statue of Saint Roch was produced, although it was sculpted by Pierre Loison who was born in 1816 and after initially being an apprentice clog maker people realised his potential and he was able to study at the Ecole des Beaux Arts in Paris to become a French sculptor. After starting to present works at the Salons for French artists, Pierre Loison received several commissions for statues and sculptures to adorn different tourist attractions such as this one of the Eglise Saint-Roch and no less than 8 for the famous Musee du Louvre, also being awarded the Legion of Honour by a formal decree dated 12th July 1859. 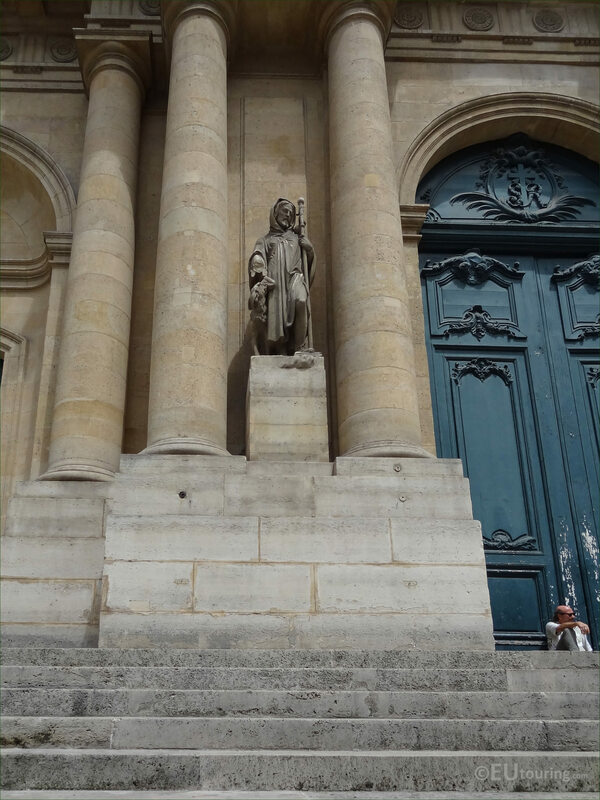 However, this photograph shows the location of the Saint Roch statue positioned on a pedestal on the lower level in between the columns to the left hand side of the main entrance doors to the Eglise Saint-Roch, which is located on the Rue Saint-Honore in the 1st Arrondissement of Paris.